Does anyone know whether there is an organized effort to develop (La)TeX classes/packages specifically designed to create ereader-friendly PDFs? My question is not how to create such PDFs using LaTeX, since Lev Bishop provides a fine summary of currently available methods in an answer to this question. Edit: Would it be feasible to generate usable epub (or [insert your favorite eBook format here]) documents using LaTeX? 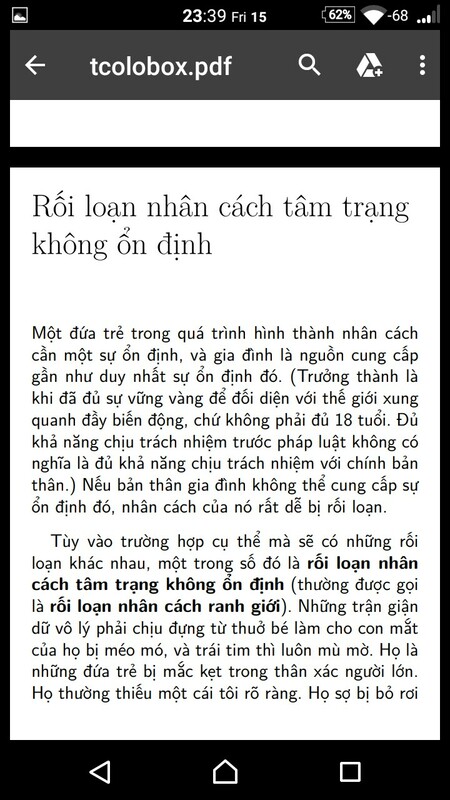 I'm not very familiar with how epub documents/readers manage font-scaling, etc. If so, is there a project to create a program that would do this? a font thicker than CM (by default). As a result, I get small pages, with small margins, a really nice font, pleasant to read, and embedded in the PDF, and the PDF metadata set so that it shows up nicely in the e-reader book listing. Tuning font size, font family and margins are easy things to achieve in LaTeX. You can set the value of DIV manually to fit your needs. DIV represents the space allocated to the text in your page, so the bigger the value, the smaller the margin. Standard calculated values are listed in the Koma-Script documentation. and then there's a lot of nice Type1 or OpenType fonts that can be used, too. pdf(la)tex embeds fonts in PDF documents, so there's no real limit to what you can do. See also this; in particular, Peter Flynn references a mailing list devoted to the topic. It can easily be switched back by commenting out \ebook. Compiling with XeLaTeX gives better result than pdfLaTeX (I don't know why). As has been noted in other responses, and in links provided, it is easy enough to shrink margins and choose better fonts. However, the PDF reader software, available on phones and other devices, may have shortcomings. I can read PDF on my old iPod Touch v4 (yes, v4) using the Foxit app. Tiny screen, but works. One general problem is that, in most cases, TeX does not place the space characters in the PDF. Words are separated by distance between them, not by an intervening space character. Some PDF readers understand that the distance is to be interpreted as a space, but others do not. This makes a big difference if the file is to be audibly read by having software parse the words. It also makes a big difference if the document is allowed to reflow, rather than simply zooming in by scale. Some software allows you to "force" reflow in PDF files that are not themselves set for reflow. Currently, compiling with pdfLaTeX allows you to specify that spaces will be placed (they are drawn from a special font). But LuaLaTeX does not have this capability. I do not know about XeTeX. Keep in mind that, as small screen size, the typographic merits of TeX will largely be obliterated. With reflow, they will actually be ignored. The main reason for using TeX for an ebook PDF is if you need equations and diagrams. But if the book is primarily text, you are better off simply doing it directly in XHTML (which converts easily to native ebook formats, rather than PDF). In this case, you will have little control over fonts, and even less control over typography. Also, if your purpose is to sell licensed copies of your writing, then it will need to be in the ebook format marketed by the major providers. There is no easy way to attach DRM to a PDF (not for amateurs, that is). Existing methods either involve special software or a special server, and are a bit of a nuisance to general readers. Splitting subfigures across multiple pages — but programmatically! Why is the ebook package not good to use? How to make ebook-friendly formula heavy documents? List of agreed transliterations for TeX related logos for ebook publications?